The four-day event which has been hailed as Ireland’s greatest rock music event was recently named the Best Irish Festival for attendances between 10,000 and 30,000 at the Irish Festival Awards. The tribute festival takes place in Ballyshannon between Thursday 31st May and Sunday 3rd June. Organisers hope 2012 will be the 11th successive year of the festival which attracts thousands of Rock ‘n Blues enthusiasts to South Donegal. Organisers say they are expecting major international acts to be announced in early March. 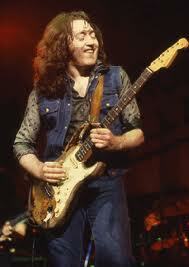 The festival was born as a tribute festival to Ireland’s greatest rock blues guitarist, the late Rory Gallagher. The festival is organised by a voluntary committee. O’Neill says, “in the coming weeks we will announce a number of significant internationally acclaimed headline acts. The nightly concerts will take place in a 2,000-person capacity big top while the street entertainment will continue over the three nights in the open air. The festival is a fitting tribute to Rory’s musical legacy and we will honour that by attracting some of the world’s the top classic rock and blues acts to Ballyshannon”. Among the acts announced in the preliminary line-up are annual favourites Pat McManus Band (ex. Mama’s Boys), local legends “Boxtie” featuring Johnny Gallagher and internationally acclaimed Tribute bands “Sinnerboy” from Manchester, “Remember Rory” (Germany”, “Laundromat” (Holland). Making a first time appearance in Ballyshannon will be the Larry Miller Band. Larry is a highly respected guitarist across the UK rock blues scene, having last year headlined the Cambridge Rock Festival. Other acts that will be make debut appearances in Ballyshannon are Scottish outfit – “Against the Grain” led by the electrifying Doug Carroll and a first-time band from Spain called “Good Taste”. In all, 21 top class Rock ‘n Blues acts have been announced, (see below), and several more headline acts will be added to the festival line-up in the coming weeks, including renowned international acts. Those additional acts and the full programme with ticket sales details to be revealed in early March. Thousands of Rory’s loyal fans and Rock Blues music followers will converge on the hometown of the greatest guitarist ever, for four days of open air concerts, street gigs, nightly concerts, pub gigs, workshops, exhibitions and much more. The Rory Gallagher Festival websitewww.goingtomyhometown.com has all the details relating to the four-day festival. The Rory Gallagher Festival takes place between Thursday 31st May and 3rd June 2012 in Ballyshannon, with the support of the Ballyshannon business community and our key funders – Failte Ireland, Donegal County Council and Ballyshannon Town Council with Guinness Ireland / Diageo as the main corporate sponsors. * A Unique Concert with JOE O’DONNELL who released the acclaimed album entitled “Gaodhal’s Vision” in 1977 with Rory Gallagher and Phil Lynott.